Up and down, stock market anyone? The Dow Jones closed at 10,092.19 last night (10.19.2008). This is definitely big news. The stock market has seen a big recovery in the last year from a low of about 6500 about half a year ago to above 10,000 last night. In just 12 months, you’ve seen the Dow go from about 9000 to 6500 to 10,000. It has been on a generally upward trend in the last half year and many are saying that the market has already reached its low point and it is now on its road to recovery. By looking at the 1 year chart, one can easily assume that the upward trend is indicative of future. Is it? The chart below reflects the Dow Jones index for 1 year. Here’s my contrarian view. Price is a reflection of value – at the rate things are going, stock prices may seem to be over-priced. The market reacted positively on news about companies making a profit in the last quarter. What about the losses of previous months? When we go into business, we need to look at a sustainable flow of profits and not just on a seasonal spike. Have the corporations recouped all their losses of the past? I’m one who always wants to hear good news and news of recovery is always good for everyone to hear. However, we must always look at the big picture of things and from a wider vantage point. Is the stock market really heading for recovery? That can only be answered by looking at how the economy is doing. The stock market can be looked as a mirror of the economy but not all mirrors reflect its true picture. Some mirrors reflect a distorted view (I want one that makes me look 50 kilos lighter!) and from my point of view the stock market is that kind of a mirror. The stock market is a reflection of the people’s sentiment which is always exaggerated. If you study human behaviour, you will see that people can be overly pessimistic (bearish) or extremely optimistic (bullish). People say that the stock market, though volatile is generally on an upward trend. So if you placed your money in the market 10 years ago, you should have made good money by now. The chart below reflects the Dow Jones index for 10 years. Has the market really reversed it’s trend? Has it really bottomed out? Personally, I don’t think so. Ultimately, the natural forces of Economics will eventually reflect the true state of the stock market and I will be going out on a limb here by saying I don’t see a rosy picture. In a make or break statement, I’ll be going on record here by saying that there is a very big possibility that the market will go south between 1 to 3 years. Not just a minor correction of about 1oo to 200 points in the Dow… hmmm, something below 600. If I am wrong, then it’s good news to everyone. If I am right, then woe to all of us… this is one time I pray I am wrong. So does this mean that you should totally forget the stock market? By no means. The stock market will always be a viable asset class for one to invest in. It’s volatility allows for people to lose money but can also do the opposite. Had you entered the market 6 to 8 months ago, you would’ve made a lot of profit already. You need to look at the stock market as one of the avenues for you to put your hard earned money but it should always be consistent with your investment objective, time frame and your risk tolerance. Stocks will always be an asset class for people to consider but to think of the market as the only place for you to grow your money is foolish. Understand your needs and the purpose of your investments. Growing money just for the sake of it is not a purpose worth pursuing. Think about your goals and the purpose of those goals, then act on it accordingly. Learn about Investments the right way. 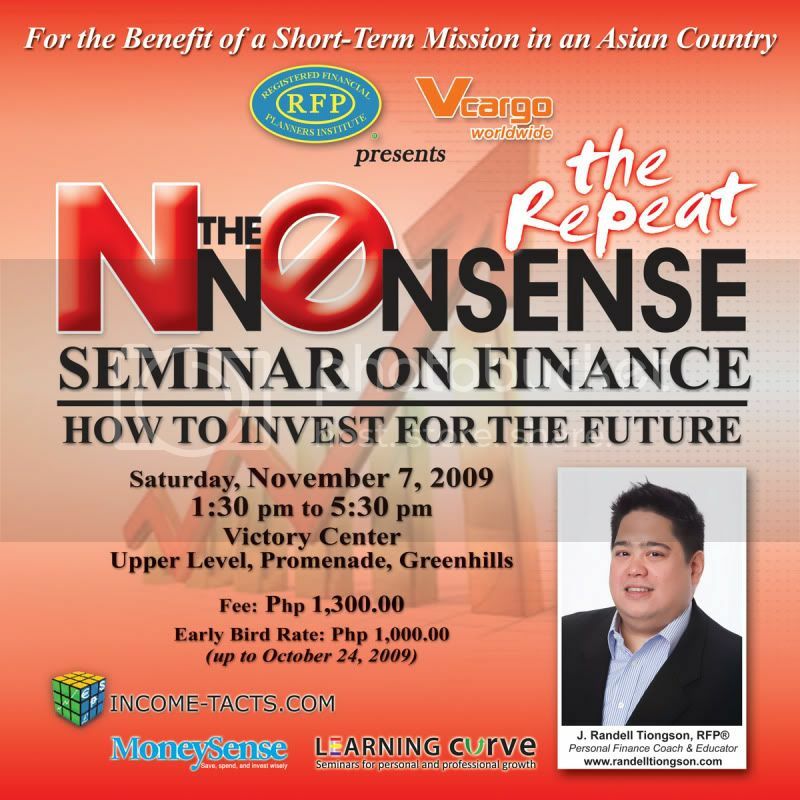 Attend the No Nonsense Seminar on Finance: How to Invest for the Future! I think what’s pushing up the market is the financial stimulus – trillions of dollars which finds its way to the stock market. When inflation kicks in, I think this will eat up on corporate earnings. And then the market will drop. People speculating on the market movement based on what they have seen and heard mostly end up losing their pants. Stocks generally reflects the peoples reaction on certain fundamentals and not necessarily on the actual economic condition. A good sailor knows there is an underlying current that would pull you down despite a calm ocean surface. When is the right time to enter into investment? For sure the blogger can educate you. I just subscribed to your RSS feed after reading this item! Could you put up more regarding this topic in future articles?